The first time you visit New York City, or any new destination, the question asked isn’t usually what attractions should be scene but what attraction to see first, what to expect, how to get there, and how much time is needed. We’ve provided tips, advice, and other information about the top tourist attractions in New York City to help with your itinerary planning. The Statue of Liberty was presented to the United States as a gift from France on October 28th 1886. The gift commemorated the friendship and values shared between the two nations. The Statue of Liberty was first proposed by French statesmen, Edovard de Laboulaye, and later designed by Auste Bartholdi. Every American should visit the Statue of Liberty at least once in their lives. After all, Lady Liberty is the face of freedom, liberty and the American way of life. Over the last century she welcomed millions of immigrants, seeking just that, to America. You can’t help but feel patriotic the first time your eyes look upon the Statue of Liberty. Due to post 9/11 security measures, tourists are no longer permitted to enter the Statue of Liberty. 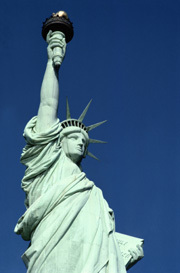 Still, breathtaking views of the Statue of Liberty can be had from Liberty Island, Ellis Island, and even Battery Park. Ferries depart to Liberty Island and Ellis Island every 30 minutes and the ride takes about 20 minutes. Lines can get bad on the weekends so plan accordingly. The Empire State Building has had a long run as one of New York City’s top attractions. The building was completed in 1931. At 1,454 ft, the Empire State Building was the tallest building in New York at that time and remained so until it was surpassed by the World Trade Center in 1971. The Empire State Building made perhaps its most famous movie appearance in 1933’s King Kong. Since then, the Empire State Building and its familiar spire has become one of New York City’s most famous landmarks. The Empire State Building regained its status as New York’s tallest building on September 11th 2001. The observatories on the 86th and 102nd floors attract thousands of visitors daily. The panoramic view of the city is nothing short of remarkable. From the Empire State Building, even the Statue of Liberty looks like miniature replica. Tickets are required if you wish to visit the observatories. You can order tickets in advance or purchase them at the Empire State Building’s ticket office, which is on the ground floor. Lines vary throughout the day so expect the worse. My parents used to joke about the time when I got lost, when I was a kid, in an adult bookstore in Times Square. New York City’s Times Square has come along way since then. Today Times Square is highly commercialized, with giant glittering neon signs and billboards all along Broadway. Most of the restaurants and stores around Times Square are national chains that target the tourist dollar. Broadway shows that target the tourist market are also centered around Times Square. There’s a ticket office on the far end of Times Square where you can find discount tickets for Broadway shows. If you’re visiting New York City, you have to at least walk by Times Square. Chances are you’ll end up there anyway. It’s worthwhile to spend some time exploring the area. However, there really isn’t that much to do in Times Square. Most New Yorkers actually try to avoid it. The NBC Studio Tour is one of the coolest things to do while visiting in New York City. The tour offers a behind the scenes look at the inner workings of the popular television station. The tour begins with an interesting video presentation focusing on NBC’s storied history. Groups then get to explore actual TV studios. Some of the sets that may be visited include that of Saturday Night Live, Late Night with Conan O’Brien, and Dateline NBC. The day’s production schedule dictates which studios are seen on the tour. If you’re lucky you may even get to see casts and crews at work. Authentic costumes and props are on display through the tour. After touring the studios, you get to checkout a working control room. The NBC Studio Tour concludes with a fascinating look into the future of television. Hours S-F 7:00 am - 8:30 pm, Sat. 8:00 am - 8:30 pm. St. Patrick’s Cathedral is one of the more familiar landmarks in New York City. Most recently, it appeared in the popular Spiderman movie. However, there is more to the gothic style church then just its celebrity status. Construction of the cathedral was completed in 1906. Since then, St. Patrick’s Cathedral has become the largest Roman Catholic Cathedral in the United States with a congregation of over 2,000. The best way to experience St. Patrick’s Cathedral is to attend mass. Cardinal Edward Egan presides over the congregation. His Sunday mass draws a large crowd and is often televised on religious holidays. If you don’t want to attend mass, you should at least take a quick peak inside between services. The interior of St. Patrick’s Cathedral is almost as impressive as the exterior.